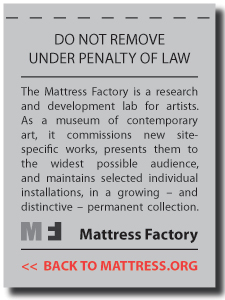 Interested in learning about installation art and the Mattress Factory? Then check out our Community Outreach programs! Through these educational opportunities, we give students an introduction to the museum, our artists, and our ideas. We offer hands-on activities that can be brought to your school, community, organization, or event. Outreach programs sustain meaningful exchanges with K-12 students that develop deeper relationships to the MF specifically and its resources that include visits to the museum, teaching artist residences, hands-on projects and support/mentorship from our educators. These programs usually consist of weekly school visits or after school outlets where students work on a variety of different learning objectives that are meant to facilitate growth in the arts. In the past, Outreach has made sculptures out of reusable materials, Shibori pillows, yarn paintings and stop-motion videos! We work with students all over the city, and specifically focus on providing programming to North Side schools and organizations. If you would like more information about Outreach or other education programs at the MF, please email education@mattress.org. We love to share what we do!